Using Pai Mu Tan, a Chinese White tea from Fujian Province and is one of the least processed of all the teas which means that it is the least caffeinated and has the most health benefits. Blending it with these three 'super' berries creates a cup that is full of antioxidants such as; Vitamin C and anthocyanins, two important disease fighting ingredients. Type of Tea- Flavoured Chinese White Tea. Ingredients- White Tea, Elderberries, Aronia Berries, Blackcurrants, Natural Flavouring, Mallow Blossoms and Pink Cornflowers. Brewing Guide- Using water cooled to 75-80 degrees and steep for 2-3 minuets. How to Serve- This tea is best served as it is. Tasting Notes- delicate floral, super tea with three super berries to create a wonderful fresh and fruity cup. Colour in Cup- A deep champagne coloured liquor. Storage- in an airtight container away from heat and strong smells. Health Benefits- White Tea contains the same polyphenol antioxidants as green tea as it undergoes less processing and is believed to be beneficial to health, many cosmetic and pharmaceutical companies are using white tea for skin care and cancer prevention. The berries used in these teas are full of vitamin C, antioxidants and anthocyanins- the perfect recipe for a cold busting tea! 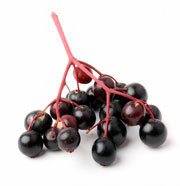 History- Elderberries which are well known for their antioxidant activity to lower cholesterol, improve vision and boost the immune system aiding coughs, colds, flu and bacterial and viral infections- Elder berry juice was used to treat a flu epidemic in Panama in 1995!, you can read more about this tea on our Elderberry Cassis and Aronia White Tea article.